Who Said Miniature Schnauzers Can’t Run? To train your miniature schnauzer puppy to use a dog door can require an abundance of patience. It is not uncommon for any dog, whatever their breed, to have a problem with going through that hole in the door. Nobody else goes through that thing so why do they think I will? I am sure that is what your Miniature Schnauzer thinks and you can hardly blame him for having such thoughts! There is an amount of fear that goes on in any dog’s mind when they are faced with something new. Your puppy has never seen this new object you place in front of him or her. You expect me to love this thing, but I am not going to do that just to please you, are the thoughts of your puppy! As it is with any dog training, you will need to build trust before you can get your puppy to use this dog door. For instance, your puppy has only known larger areas such as the rooms in your house. And being outdoors has no restriction, like a small pet door has. The dog door is strange to your miniature schnauzer and he has no idea of what will happen if he finds himself on the other side of this flap. 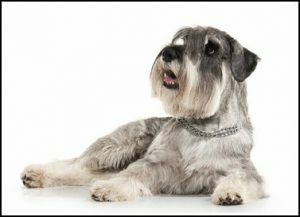 To train your Miniature Schnauzer to use the dog door of course goes hand in hand with house training, or potty training. Whatever way you refer to this, the essential plan is to get your dog familiar with using the dog door. When he needs to go outside to attend to his toileting, he should be comfortable with going through this door. The way to start training your puppy is to have him outside looking in through the dog door. Then you stay inside, kneeling on the other side of the door. Using your best words of encouragement, try to entice your puppy to come through the flap of the dog door. Have your puppy’s favorite treats ready to give him, in the hope that he will take action, and move inside through the door that he is so puzzled about. It may take some time before your puppy will even slightly attempt to use the dog door, but keep encouraging puppy to come through the door to get his favorite treats. Lifting the flap of the door and letting your puppy see you as best he can should help to entice him. What if Your Puppy Won’t Go Through the Door? 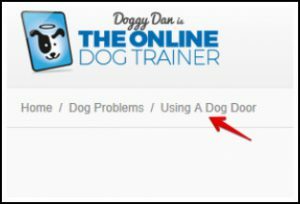 One of the great videos in Doggy Dan’s program is about training a puppy to use a Dog Door. You could find this very valuable, particularly if you need other training advice for your puppy or older dog, as well as dog door training. Dan is a professional dog trainer and his program TheOnlineDogTrainer.com is the only dog training program endorsed by the New Zealand Society of Prevention to Cruelty of Animals. Visiting my Review of Doggy Dan’s program provides further information. When puppy becomes independent with his toileting and is able to use the pet door, it is essential that he cannot escape from your property. As much as your puppy loves you, his nature is to be adventuresome which is something that needs to be controlled. I wish you and your Miniature Schnauzer many years of fun and adventure together. Your comments and questions are welcome. Please leave them in the space provided below. Puppies are just the cutest thing on earth! I mean, this is kind of a subjective thing to say but it can be true to some people. You can have them as your friend. You can play with it and you can also share secrets without it betraying you. You can actually find comfort in this creature! One of the tricks that you can teach it is to use a dog door. This may be tough at times but soon enough, your puppy will be able to do this simple task. This article is a living proof that it is possible. This is such an enlightening read such that puppy lovers would know how much their pet can do! I love what you say about being able to share secrets with our puppy, and that we can find comfort in them. They certainly are wonderful creatures. I am so pleased you found the article enlightening and helpful for those teaching their puppy to use a dog door. Thanks for visiting the website and for your comment. Hello I am thinking about installing a dog door for my puggle he is still new to being in the backyard because i finally got around to putting up a new fence so he can play out back. Next step is a brand new dog door so can I use these same tips to train my doggy? Thanks for visiting my website and leaving your comment. I’m pleased to read about your new puppy being able to be in the backyard at present. When you install a new dog door you will need to train him using the same tips as in the article. All the best, and have fun with your puppy. This was a good article. It never dawned on me that dogs would need to learn how to use a doggy door. We have never had a doggy door but it makes sense that they would be unfamiliar with it and possibly scared of it. Good tips on having treats waiting for your dog on the other side when you are training him and letting him see you as well, that’s motivation for him to go through for sure! It is amazing how timid dogs can be when they are faced with something new that we humans put in front of them. When you think of how adventurous dogs can be when let loose in the open spaces, their timidness within their home environment is surprising. And yes, it’s amazing what treats will do when training a puppy or an older dog. The treats help to make the process of training so much easier. Thank you Summerly for your comment. Trainingminischnauzer.com is a participant in the Amazon Services LLC Associates Program, an affiliate advertising program designed to provide a means for sites to earn advertising fees by advertising and linking to Amazon.com.